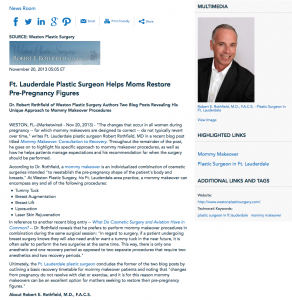 Weston, FL — “The changes that occur in all women during pregnancy – for which mommy makeovers are designed to correct – do not typically revert over time,” writes Ft. Lauderdale plastic surgeon Robert Rothfield, MD in a recent blog post titled Mommy Makeover: Consultation to Recovery. Throughout the remainder of the post, he goes on to highlight his specific approach to mommy makeover procedures, as well as how he helps patients manage expectations and his recommendation for when the surgery should be performed. A graduate of Haverford College, Dr. Rothfield earned his medical degree from the University of Miami School Medicine. He is currently the Chief of Plastic Surgery at Memorial West Hospital in Pembroke Pines, Florida and a member of several prestigious medical organizations including the American Society of Plastic Surgeons, among others. Dr. Rothfield is also certified by both the American Board of Plastic Surgery and the American Board of Otolaryngology. He is available for interview upon request.